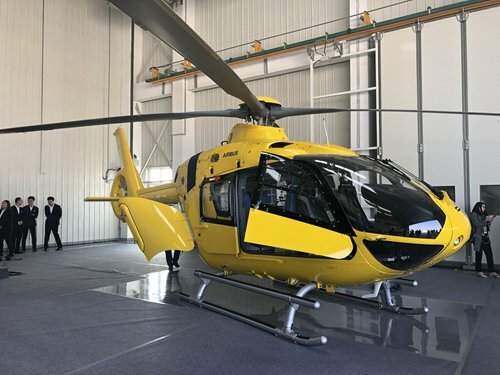 A final assembly line for Airbus H135 helicopters officially began operations in Qingdao, East China's Shandong Province on Wednesday, making it the manufacturer's first H135 production line outside of Europe amid a growing Sino-European relationship. "It opens a new chapter for cooperation between China and Europe," Wolfgang Schoder, CEO of Airbus Helicopters Deutschland, said at the opening ceremony on Wednesday. During the 21st China-EU leaders' meeting held in early April, China and the EU reached a significant consensus on bilateral ties, and they agreed that they have broad common interests in deepening mutually beneficial and win-win practical cooperation, Xinhua reported. In March, the European aircraft maker landed a massive deal with China Aviation Supplies Holding Co covering the purchase by Chinese airlines of Airbus aircraft including 290 A320 planes, and 10 A350 XWB jets. The move came as Airbus' US rival Boeing encountered a crisis and the trade war between China and the US continued. China, one of the largest users of the Boeing 737 Max-8, was the first country to order all domestic airlines to ground the aircraft. The opening of the assembly line follows a cooperation agreement signed between Airbus Helicopters, a division of Airbus, and China in 2016 for the purchase of 100 H135s destined for the Chinese market. From this year forward, 95 of these 100 helicopters will be assembled on the new line. The first aircraft roll-out from Qingdao is expected to take place in the second half of 2019. Operations will start with an annual capacity of 18 helicopters. The 6,500-square-meter Qingdao plant has four working stations - a paint booth, ground and flight test areas, and a delivery center. It "is built exactly to the same standard as the line in Germany," said a worker at the facility. The site will employ around 40 people, 23 of whom received on-the-job training in Donauw?rth. Marie-Agnes Veve, general manager of Airbus Helicopters China, told the Global Times in an interview on Tuesday that despite the fact that the assembly line now has a limited capacity, the company has room for future expansion. Veve said that once the line goes into operation, more suppliers are expected to set up operations nearby, and more activity will be conducted in Qingdao to build it into an aviation hub. Veve noted that despite the US and Europe remaining the company's top two markets by far, China will become its focus due to its great potential as the US and European markets mature. The company said it expected China's helicopter industry to grow at an annual rate of around 50 percent in the next few years, largely driven by demand from the government and commercial transportation. An industry insider told the Global Times on the sidelines of the ceremony on Wednesday that China's helicopter industry remains "an undeveloped gold mine." "Demand will be huge, especially in sectors such as search and rescue, forest firefighting and tourism under the country's push for its general aviation industry," the insider said. "The European aircraft maker might gain further share in the China market by being closer to its Chinese customers." According to an industry guideline released by the State Council, China's cabinet, in May 2016, China aims to build more than 500 general aviation airports, possess a fleet of more than 5,000 general aviation aircraft and generate business of more than 1 trillion yuan ($150 billion) in the industry by 2020. The H135, a light twin-engine helicopter, is mainly used for emergency medical services, search and rescue, law enforcement, firefighting and tourism.